As many of you know, I am the youngest of three boys. Suffice it to say, I know firsthand what it is to be picked on, even bullied. Yet I would just as quickly say that both my brothers always had my back if anyone else attempted to do so. Our father boxed while in the service and at an early age I put on the gloves against my brothers and other neighborhood friends. When we weren’t boxing, it seemed we were wrestling. Yet neither my brothers, my friends nor I had any patience for a larger more aggressive person taking advantage of someone smaller, someone not as strong or someone who did not know how to box or wrestle. This incredibly strong value I have carried with me and tried to pass on to our children and many others. Sadly, however, bullying seems to be more pervasive than ever. As someone who has committed much of my life to working with young people, I know that this is a challenge kids have faced for years. I am glad that schools and other youth organizations are taking a strong stand. Bullying is no longer only a school yard issue however. That, in my experience, is the change. 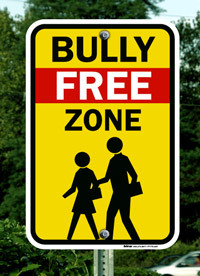 As our culture, unfortunately, has become more vitriolic and divisive, bullying has become more pervasive. What grieves me the most is that this behavior has seeped into our faith communities. A week does not go by when either I receive a call or an email from a clergy or lay person who reports bullying behavior. Your bishop is not immune either. Three times last week, individuals attempted to bully me into taking a certain action. Candidly, my innate response was one of sadness and disappointment that they had chosen this behavior. Beloved, as followers of Jesus we are called to another way. Even in the few places we read of Jesus’ anger, it is never expressed in an intimidating or threatening way. The fact is, when Jesus does display frustration, it is toward those are taking advantage of or bullying others. That is justice. “…and what does the Lord require of you but to do justice, and to love kindness and to show mercy” are the words of the prophet Micah (6:8). “Will you strive for justice and peace among all people, and respect the dignity of every human being” is the commitment we make in our Baptismal Covenant. This is our call as followers of Jesus, and as such, our expectation for both ourselves and for the world we live in – both the playground and the Church. Let us hold ourselves and others accountable to that which we are called. Some of us are aware of bullying on the street as well. At some of the World’s Occupy places the most dangerous bullies have pepper spray, and guns, and badges.